Nest Update June 7, 2013 - RumbleFish Friday! Hmmm. Well, it had to happen sometime! 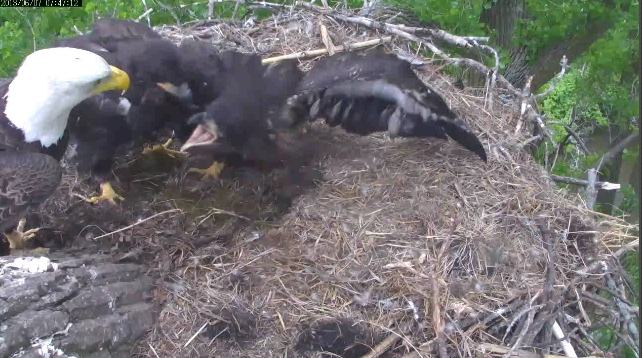 Harmony and Peace had their first sibling spat today. The day started with a late breakfish around 10:20 am. The kids were really hungry by then and made short work of the fish Dad brought in. They then settled in for what has become the routine this week, i.e. wingersizing, standing guard, moving things in the nest, and napping. About 4pm Peace decided she wasn’t tired any more and started playing with a chunk of something she found. She was sitting right above Harmony’s tail and she proceeded to drop said chunk on her sibling several times all while H was giving her dirty looks. She gave up on the chunk and proceeded to groom Harmony’s feathers while getting more dirty looks. At the end of this episode she finally decided to nap again and lay down on Harmony’s tail which wasn’t received well either. A little while later after her nap Peace was playing with a cornstalk and dropped it on Harmony’s tail several times. H finally rose to her full sitting position and gave Peace a stare. Peace tried to nip at Harmony and the rumble was on! A left, a right, a left, a bonk, a nip with each one giving as good as they got. It lasted about 10 seconds and is the most movement we’ve seen out of these two in weeks. Afterward, Peace went and sulked at the edge of the nest while Harmony sat proud in the middle of the nest. Harmony then proceeded to wingersize and give Peace a few more whacks. Things settled down for a few minutes until Mom came to the nest with some grass and Harmony tried to mantle it hoping it was supper. No such luck. 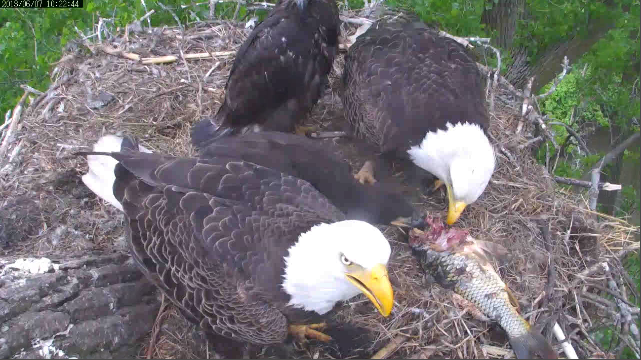 Mom came back about 2 hours later with some kind of mystery fish and the kids finally got their dinner. As the darkness fell things had settled down for the night and the crickets and frogs sang Harmony and Peace a lullaby. Peace plays while Harmony tries to nap. Harmony decides she has had enough and the Rumble in the Cottonwood is on! Harmony is hungry and will mantle anything. And a selection of pics from the day. Put that cookie right here!! Hey! That was below the belt!! Isn't that nice! Your boss has Friday off! 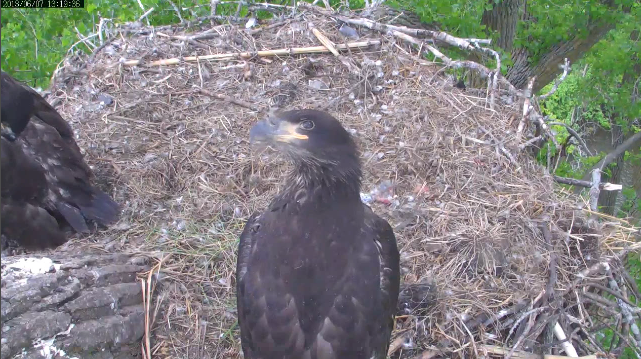 If you have been following along (and I hope you have) you will have noticed I refer to both eaglets as she. I do not know that they are females. I just feel more comfortable with the feminine pronoun because of their names. Eagle gender can only be determined by measurements and a DNA test and we will probably never know what gender Peace and Harmony are. Last year we had Kirby and Harmon and everyone referred to them as males. It’s only fitting we give the fairer gender equal time this year. A nip of the beak to Razzle and BBC for the wonderful pics and vids today! Thanks! Hope you had a great Friday on the nest and we’ll see you here tomorrow!